The first two-rounds of the 2016 World Challenge Championship took place at Circuit of the Americas. The season was off to a competitive start – all three Touring Car classes had different race winners at the opening event. Rounds three and four were well subscribed with a total of thirty-five starters – TC 15-entries, TCA 11-entries and TCB 9-entries. 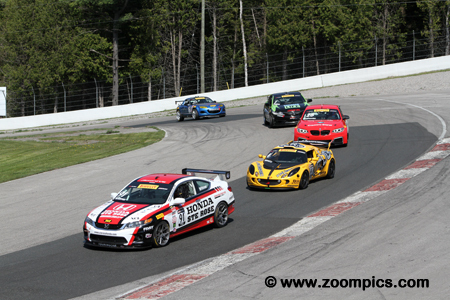 The races were 40-minutes in length around Canadian Tire Motorsport Park’s ten-turn 2.459-mile road course. 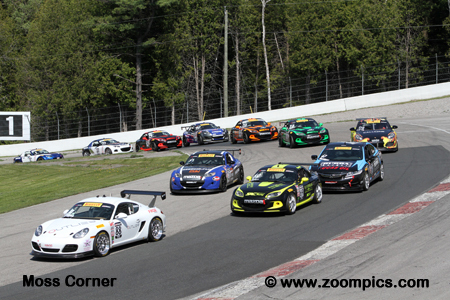 The opening lap of round three at Moss Corner. Second place, Nick Wittmer in a Honda Accord V-6 Coupe leads the Lotus Exige of Dennis Hanratty. 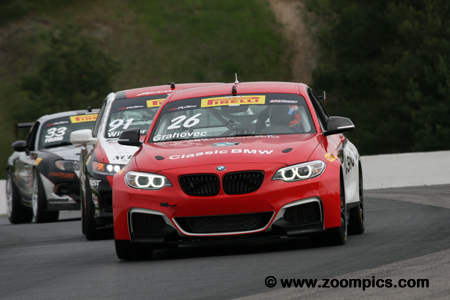 Toby Grahovec driving a BMW M235iR is followed by Jason Fitcher in a Honda Accord V-6 Coupe and the Mazda MX-5 of Randy Hale. Contact on lap-2, in round three at the exit of Moss Corner between the Mazda MX-5s of Dinah Weisberg and Joey Bickers, led to a multi-car incident. Weisberg and Bickers were able to continue but Alain Lauziere in a Mini Cooper and the Kia Forte Koup of Kris Wright required the aid of support vehicles. The accident also led to the retirement of local Honda driver Gary Kwok. 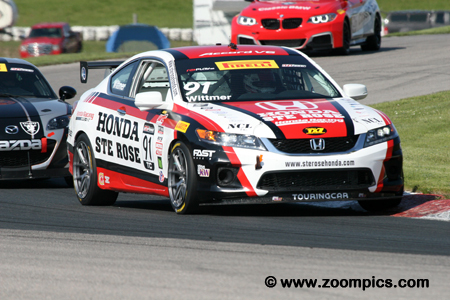 Canadian, Nick Wittmer put the Ste-Rose Honda Accord in the fourth grid position for Friday’s race. 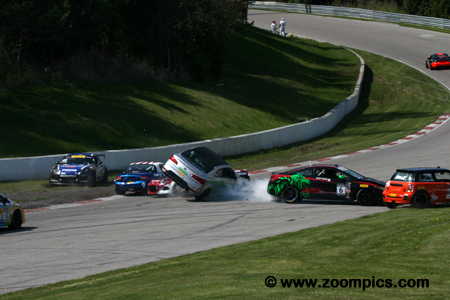 At the start, the Touring Car competitor vaulted to second and on a restart jumped into the lead. Wittmer was challenged on numerous occasions but held on for the win. 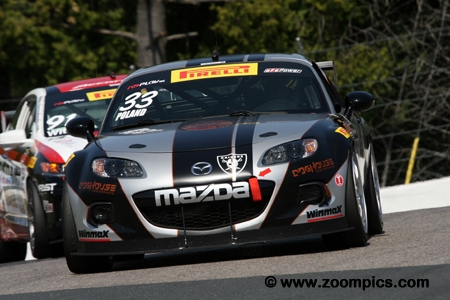 He started round four second and diced with Adam Poland driving a Mazda MX-5 and the BMW of Toby Grahovec. A late race pass by Grahovec dropped Wittmer to a second place finish. The No. 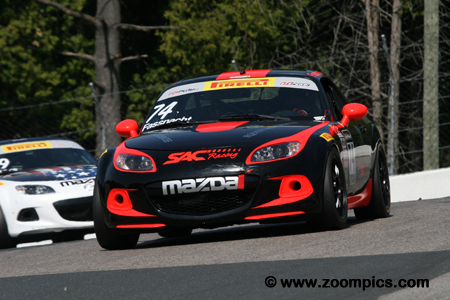 70 Mazda MX-5 Cup was entered by S.A.C. Racing and driven by Elivan Goulart. In round three, Goulart was the quickest in the TCA class and started from the pole. He was challenged by Joey Bickers and his teammate, Matthew Fassnacht but led flag-to-flag. Goulart started third the following day but moved into the lead on the first lap and scored another TCA class victory. S.A.C. Racing had a second TCA entry which was the No. 74 Mazda MX-5 Cup driven by Matthew Fassnacht. Fassnacht was challenged by Joey Bickers during Friday’s race but he was able to hold him off and finished second in class. His fastest lap in round three earned him the second starting position for round four. Unfortunately, Fassnacht fell down the order and finished eleventh in TCA. Starting on the TCB pole for round three was Will Rodgers in the No. 65 Solvang Brewing/Kelly Benefit Mazda 2. 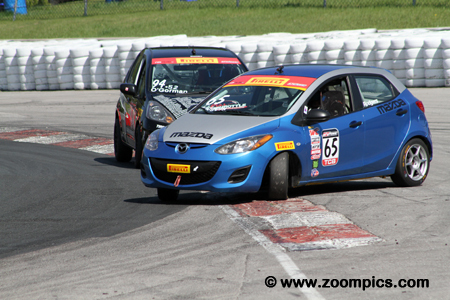 Rodgers jumped into the lead and was followed closely by the Honda Fit of Tom O’Gorman and Henry Morse in a Mazda 2. He was unable to maintain the lead and finished third. On Saturday, Rodgers started from the pole and again, found himself in a tight battle but this time, he was victorious. Toby Grahovec, the TC points leader, started round three from the third position. He ran third for much of the race but was able to secure a second place finish after a late race pass on the Lotus of Dennis Hanratty. In the next round, Grahovec started third and battled with Wittmer and Poland. On lap-19, the driving a BMW M235iR he was able to pass Wittmer for lead and a late race full course caution ensured his victory. 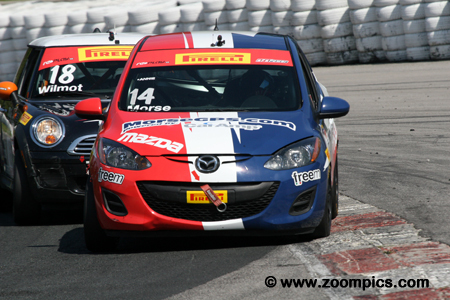 Qualifying third for Friday’s TCB race was Henry Morse in the Hale Motorsports Mazda 2. 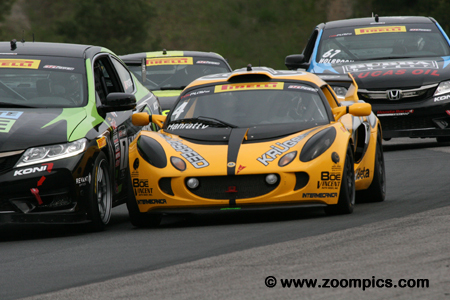 Morse diced with the Honda Fit of Tom O’Gorman and class pole-sitter, Will Rodgers. Morse was able to take the lead on the second last lap and hang on for the victory. He started race four from the second position and again battled with Rodgers and O’Gorman. Late in the race Morse made hard contact with the tires in turn-three and finished eighth in TCB. In the weekend’s first race, Dennis Hanratty qualified KRUGSPEED Racing Lotus Exige second. He battled with the Honda of Nick Wittmer and Toby Grahovec in a BMW and eventually finished third in Touring Car. Hanratty’s fast lap in round three gave him the fourth starting position for Saturday’s race. 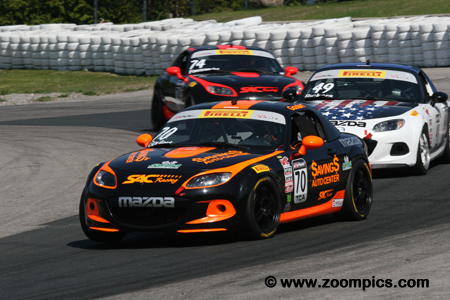 He dropped to last after contact on lap-5 but moved up the order and finished tenth in the weekend’s second event. Quickest in the final practice session was Adam Poland driving a Mazda MX-5 and he followed up this performance by qualifying on pole. The first race of the weekend was eventful for Poland. He jumped into the lead but fell to fourth on a restart. Poland charged back and challenged Wittmer for the lead but he spun and would finish tenth. His quick time in round three secured the pole again. At the checkered flag, he finished fourth. Starting third in TBC for the round three race was Tom O’Gorman. 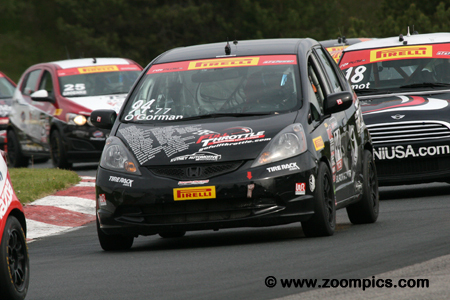 O’Gorman in a Honda Fit diced with the Mazda 2 of Henry Morse and pole-sitter Will Rodgers for the win. He eventually finished second in class. In the second event of the weekend, O’Gorman started fifth but jumped to third at the start. He was second at the checkered flag but was penalized 50-points for a technical infraction. Local competitor, P.J. 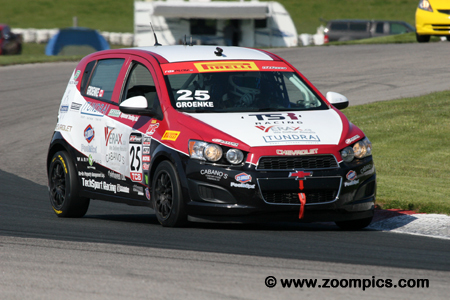 Groenke started his TCB Chevrolet Sonic from the fourth spot on the grid in the weekend's first race and after twenty-laps of racing finished in the same position. In race four, Groenke earned the final position on the podium after a fourth-place start in the TCB class.